Take in the sites and spectacular scenery of the Winelands with your private guide as you make your way through superb mountain ranges, vineyards and Cape Dutch homesteads. Taste wonderful wines and fabulous foods on the way, for a day of food and fun which we’ll tailor to your taste. We initially made this day experience with families in mind, but adults love the variety too. For people that love being out in the open, surrounded by beautiful scenery and enjoy doing things together, there is much to offer with a selection of farms geared towards wine lovers (with or without kids). You will sample a selection of some of the finest wine estates and top-notch 'family-friendly' estates. From sessions that include a tasty food pairing - think chocolate and cheese - to ones preceded by a Segway tour, there's definitely something to suit every age (and palate). With award-winning wine and delicious food on offer, a wine tasting at Spier is one of the most popular options in the Stellenbosch area. Here, the chocolate and wine pairing is a particular highlight which, as the name suggests, sees the farm's signature MÃ©thode Cap Classique and Creative Block blends complemented by specially curated chocolates. If you have children, they are offered a special grape juice tasting. For something totally different, the 2-hour Segway tour here is highly recommended. Not only is a ride on one of these two-wheeled, self-balancing electric vehicles a whole lot of fun, but it also offers a chance to experience the farm's vineyards and pastures. Middlevlei in the Devon Valley is genuinely relaxed and down to earth - a great antidote to stuffy wine farms. Go for the boerebraai (traditional South African barbecue) where kids receive a special basket with treats including a 'stokbrood' - a bread they can cook themselves over the open flames. Little ones are encouraged to run wild on the lawns and feed the farm animals - look out for the wallabies - and no-one will look twice at muddy feet. With an outdoor wooden deck and a generous fireplace, Mulderbosch's tasting room can facilitate tastings in both the warmer and colder months. But what makes a session at the vineyard truly special is that you can pair its full range of wines (up to five per session) with delicious, thin-based, wood-fired pizzas. Alternatively, if you are just in the mood for a nibble, you can opt for a charcuterie or cheese board. A mere 45-minute drive from Cape Town, Spice Route's delightful village set-up in Paarl is the perfect day out for the whole family. Aside from fabulous restaurants, there's a smorgasbord of tempting things to do, see and taste! There's craft brewery that offers an ultra-slick beer tasting, Wilderer distillery for grappa, an art gallery, a glass-blowing studio, a biltong bar...and more! The most popular activity is the guided chocolate tasting at DV Artisan Chocolate. Here a tutored 'adult-version' wine pairing is highly recommended although younger kids will prefer the shorter 25-minute chocolate tasting. The Franschhoek Motor Museum offers visitors a special opportunity to look back at more than 100 years of motoring history with its unique and exciting collection of vehicles, motorcycles, bicycles and memorabilia in the magnificent setting of L'Ormarins. You can enjoy this amazing day exploring the food and wine and stunning scenery of the Winelands either from a base in the Winelands, or from Cape Town. You can do this any day you please and it is available all year. We arrange this trip on a private tailor made basis. We would pick you up from wherever you're staying and drop you back there in the late afternoon/evening. There are many different options we can include for you so we would talk to you about the kind of focus you want, for example more chocolate and less wine. This really does make a trip to the Winelands very special. 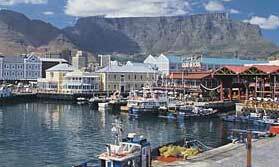 Table Mountain, stunning coastal scenery, penguins, plus wine tasting. Heaven?